One of the hardest things for an IVF specialist to do is to manage a patient's expectations. It's hard being infertile and infertile patients come to an IVF specialist with a lot of hopes and dreams and desires. They expect the IVF specialist to help them to have a baby - and understand that IVF represents their best chance of actually becoming parents . Empathetic IVF physicians understand how much rides on the outcome of an IVF cycle, and do their best to keep their patients hopeful. Doctors are naturally optimistic by nature - and when a patient comes to you in pain , you want to your best in order to help them achieve their goal. The problem is that this often leads to overpromising ! When IVF doctors do a consultation for the first time , they are on their best behavior . He is trying to market himself , because he wants the patient to take treatment which him, rather than go to the competing clinic down the road. Doctors also have high self-esteem , and some of them actually do believe that they are the best IVF doctor in town , which is why the best option for the patient would be to come to them ! ( Also, like all human beings, we tend to remember our successes and forget our failures ). When you want to convince the patient that you are the best IVF doctor , you tend to focus on all the positives and gloss over the things which can dishearten the patient. This is why IVF doctors are often overoptimistic during the first consultation . This creates the problem that patients have excessive expectations from the IVF cycle. Everyone starts an IVF cycle with the hope that it will succeed , and even though they understand with their head that IVF has a failure rate , in their heart of hearts they think that it's going to work for them. ( No one would strat an IVF cycle if they thought it was going to fail !) This is why when the cycle fails , they often go to pieces. It can be very hard to manage the emotional roller coaster ride . A good doctor will try to provide a realistic picture , but this can be hard to do - and some patients actually get put off when doctors talk about the possibility of failure. They feel the doctor is being excessively pessimistic , and must not be very confident about his own abilities. IVF doctors have learned the hard way that if they are honest and forthright and discuss the possibility of failure on the first visit, patients get put off because they don’t want to hear about problems – they’d rather go to someone who talks sweetly to them and promises them a baby ! Doctors are scared that being too honest will scare their patient off – and they don’t want to lose their patients to another doctor ! One way of addressing this problem is to make sure that patients get independent counseling . I think it’s even more important that patients invest in information therapy , so they're well prepared and understand that the outcome of any cycle is always going to be unpredictable, no matter how good their doctor is. 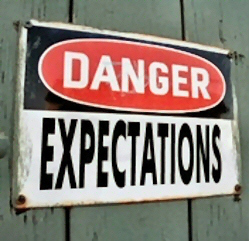 If patient expectations are not managed properly , patients are likely to be unhappy and dissatisfied when the cycle fails . They are often bitter and resentful , and a lot of them will vent their anger on the doctor. Sometimes doctors do deserve some of this resentment , because a lot of them actually abandon the patient when the cycle fails . They are not interested in talking to the failures, and would rather focus their energy on attracting the next new patient who is waiting to see them in the clinic, rather than spend time counseling and supporting the patient who is distraught because her cycle has failed. Patients start feeling that IVF doctors are greedy and mercenary – and that their primary goal seems to be to make money , rather than care for their patients. Unhappiness equals Expectations minus Reality - and unhappy patients can create unhappiness for their doctors ! Another way of managing expectations is to offer a guaranteed pregnancy treatment option. You can read more about this at http://www.drmalpani.com/guaranteedpregnancy.htm. This helps to align the doctor’s and the patient’s interests . The patient is comforted that the doctor is willing to put his money where his mouth is ! More importantly, it ensures that the patient no longer thinks about IVF treatment on a single cycle basis – they understand that it may take time to achieve success, and are willing to invest their time and energy in working with their doctor towards success !